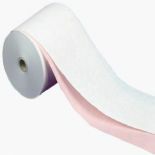 Our till rolls come in a range of sizes in A grade paper and 2-ply. They can fit in a variety of makes and models and are great for small businesses. Adding your business address, website or other contact details to the top of your reciept means that customers will be able to contact you again with ease.